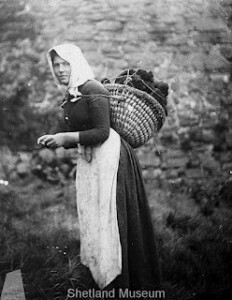 A typical depiction of a ‘kishie’, a traditional basket used in Shetland for carrying. Apologies for the recent silence on the blog front – it’s been that time of year when everyone is away on their summer holidays. I spent last week in Scotland representing MERL and the Heritage Crafts Association at ‘Woven Communities’, an international basketry symposium held at the University of St. Andrews. The overall project, of which the symposium was a part, seeks to document basket weaving communities in Scotland, both heritage and contemporary, and to create a publicly available compendium of the vast wealth of information that springs from this process. The idea for the project grew out of the Scottish Basketmakers Circle, and has been funded by a research grant from the Arts and Humanities Research Council. We had two packed days of speakers, which included a mix of basketmakers, curators and academics, with presentations along two key themes. 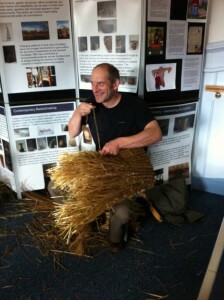 The first day centred on different communities associated with basketmaking, such as makers, growers and curators. The second day had a more temporal theme, looking at basketry in the past through the archaeological records, in the present and in the future, with a focus on ideas of sustainability. I was lucky enough to have been invited to speak, and gave a talk on the topic of intangible heritage and heritage craft which focused on issues of relevance, sustainability and values in associated with heritage craft. Have a look at my HCA Day One and Day Two blog posts to find out more about the conference in general. Ewan Balfour making a kishie and enjoying the presentations. The conference also included a chance for participants to have a go at making one or two simple things, and we were welcome to carry on throughout the conference – it was great to see people working away with their hands, exploring materials and having an experiment while listening to the talks. Ewan Balfour, a landscape architect and basketmaker from Shetland, could be seen on the first day making what seemed like an endless length of rope, and on the second day he made a ‘kishie’, a traditional Shetland basket used for carrying, most commonly for peat. 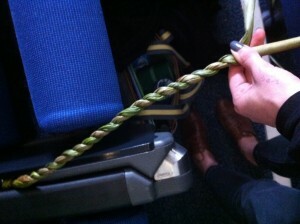 I made this piece of rush rope at one of the hands-on sessions. There was a familiar cry coming from the museum cohort at the conference: we need basketmakers to come in to our museums and tell us about our basketry collections – what materials they’re made from, how they were made, how they were used etc. – as most museums, including MERL, don’t have the knowledge and expertise in-house. The challenge is to find a systematic way of working with basketmakers and recording the information they are able to give, rather than on the ad hoc basis which more often takes place when researchers come to visit collections and share titbits of information. There is perhaps the making of a project somewhere in this. Felicity Wood, an Oxfordshire basketmaker and collector, has been working with the Pitt Rivers Museum to put together a website about their basketry collections. Having noticed that many people wrongly identify the materials used in a basket, she has also compiled a ‘materials identification toolkit’, with samples of willow, cane, rush etc. – I’m sure this error has also occurred at MERL. I think this could be a useful tool for museums with significant basketry collections. As a result of the conference, I think I might need to revisit some of the cataloguing work I did on baskets, especially the kishies, which I had thought were always used for carrying peat, when in fact they can be used to carry almost anything. This encapsulates what the ‘Woven Communities’ project is about – it’s about sharing knowledge.